I have this pedantic need to start at this beginning, to know it all. I can never casual bounce into a TV show, if a movie that I haven’t seen is on and it’s already started I won’t even bother watching it and you best know if I come into a story halfway through you have to start from the beginning again. So even though I have been reading Marvel comics off and on for a long time, my obsession with the MCU especially Agents of SHIELD, Agent Carter and the podcast LEGENDS of SHIELD got me wanting to read the comics more orderly, and thanks to the podcast I was introduced to CMRO Reading Order. I’m 50 comics in and apparently it doesn’t get really good until after about 300 but to the point where I’ve gotten it has revealed so much about the times, the sociopolitical status, and a lot of other interesting things. I skipped Golden Age (I’ll get to that again, and started in 1961 with Fantastic Four #1) and have introduced to heroes like the Fantastic Four, Ant Man, the Incredible Hulk, Spider Man, Thor, and Iron Man. Out of all the male heroes so far, I like Bruce Banner the most, which was strange to me because I adored Peter Parker when I was younger, and perhaps it was the way he was written now, but I was like ‘quit whining child’ it could also be that I’m a lot older than when I last read a Spider Man comic. I’m aware that these are still the beginning stages and most of the characters aren’t as fleshed out yet but what appealed to me about Bruce is not only his want to make the world a better place (pretty much all of them want to do it) but his willingness to continually sacrifice himself to the pain of becoming the Hulk to do that. Saving the world shouldn’t be easy, saving the world is giving up apart of yourself. The only female hero so far is the Invisible Girl, who is often treated so terribly by the rest of the Fantastic Four and the writing that sometimes I am glad that there is only one female so I don’t have to constantly cringe. So it’s no secret that I have a weakness for ships when one character is a villain or totes bad but has a soft spot for one person in particular, and Fantastic Four really brought out that side of me with the Sue Storm/Namor the Sub Mariner romance, it’s twisted, it’s good vs evil, but yet she still owns up to the fact that she wants to bone that. But of course boring Mr. Fantastic and the rest of the team kept cockblocking. And I know how this story will end, and sigh, all my trash ships are always doomed but a girl can hope right? The rest of the females are the love interests – Betty Ross and Jane Foster – and of course, Aunt May. Of the two love interests I greatly prefer Betty Ross, although she’s always hanging around her father, General Ross, and I’m like girl you’re going to get shot, or doesn’t she have a job or something, she’s almost like Iris in The Flash. As a love interest she is more appealing to me because even though I literally want her to talk about something other than the fact that she’s crushing on Bruce Banner, she actually does seem to really like the dude for who he is. It’s extremely difficult to go back and read these comics from the 60s with a modernistic point of view but I didn’t think that the comic would make the Natalie Portman version of Jane more likeable to me. The whole ‘we like each other but are too scared to admit it’ act works well for Bruce and Betty but not so much with Thor/Don Blake and Jane, I literally roll my eyes whenever the two of them are together in a panel, the fact that she is now claiming to be in love with Thor not knowing that he is Don Blake just makes it worse. Perhaps I’m a bit harsh, I probably am. 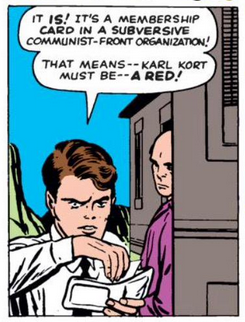 It’s interesting to note the strong trend of anti-Soviet themes, most of the villains thus far that aren’t aliens were Soviets, across the board from Fantastic Four to Hulk to Ant Man, they are always trying to steal secrets or infiltrate the US, there was a funny moment in a the Hulk when a spy was caught out because they found a card in his wallet saying he worked for the USSR, and then of course there was the origin story where he saves himself from terrorists in the Far East by using the equipment that they give in to build weapons to make a super suit.